Carmel-by-the-Sea, or more often simply Carmel, is an especially beautiful seaside town just five miles south down Highway 1 from Monterey City, California. Carmel is small but beautifully formed. You can stroll across it in five minutes towards an idyllic, white sandy beach. 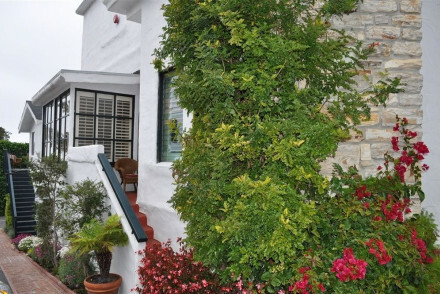 Some of the best places to stay in Carmel share this relaxing and sometimes invigorating ocean view, while some have views of the Carmel River and lush Carmel Valley. Carmel is an upmarket, adult destination with nice galleries, cafes, boutiques and restaurants - some of which are open air. Expect to see some glorious sunsets during dinner. Also expect to see people dressed nicely for lunch and folk driving convertibles slowly down the main street. 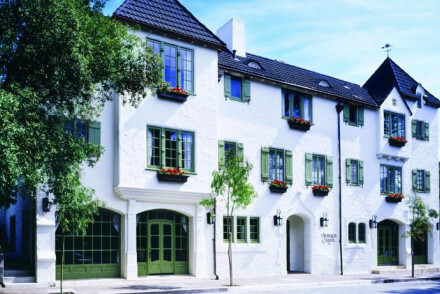 This pretty town is a busy spot year round, so if you want to book one of the best places to stay in Carmel, get organised and plan well ahead. Carmel’s pretty views and sandy beach have been attracting visitors since the 1880s and it has been especially popular with artists and writers - many who’ve been inspired to feature the famous beach fog in their work. Carmel Mission, founded in 1771, is probably the town’s main ’sight’. It is said to be one of the most beautiful of California’s Spanish missions. 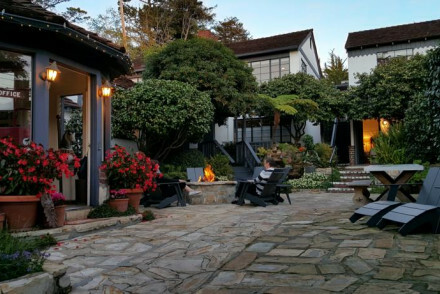 This is a great spot for a weekend break, or overnight stop, but Carmel also works as a base for exploring the coastline along Highway 1. Nearby you’ll find Point Lobos, a state park with walking trails, more exceptionally lovely coastal views and sea lions. Carmel has long been a stopping point along the Californian coastline and the Coachman's Inn embraces the town's itinerant culture. Awash with character, the hotel boasts charming rooms, a deluxe spa facility and is located at the heart of the town. 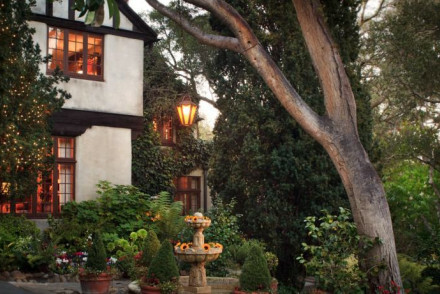 The Old Monterey Inn set around a lovely garden brimming with charm and intimacy. The bespoke rooms serve as great sanctuaries after a day of exploring Carmel's sights and scenes. L'Auberge is a luxurious 20-room property close to the beach. As well as offering in-room spa treatments and plenty of charm there is also an award-winning restaurant, The Aubergine, which can also make you a lovely picnic for the beach. 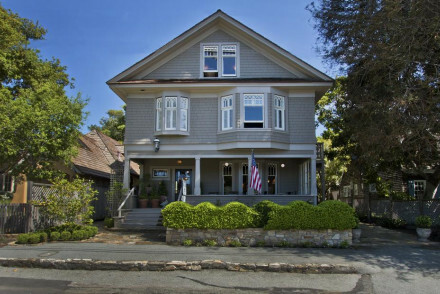 The Sea View Inn is a charming property on the outskirts of town. Beautiful rooms have window seats, canopied beds and wonderful ocean views. Rooms start from less than $150 per night. Vagabond's House Inn has thirteen individually designed rooms where modern elegance complements period features. There is a charming courtyard and a firepit for exchanging tales with fellow guests, plus you're just a short walk to the centre of town. Monte Verde Inn, located just a short distance away from the beach, boasts tasteful accommodation with splashes of colour. It is also dog and child friendly making it the ideal place for a family break. Gosby House Inn offers traditional rooms with garden views. Make use of the free bikes available to head off exploring all over the coastline. 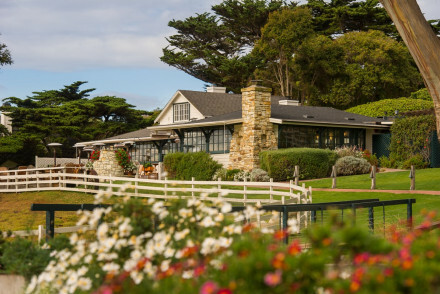 Set right on the coast, Spindrift Inn boasts fabulous views of Monterey Bay and provides classically elegant accommodation - think four-poster beds and plush fabrics. A romantic spot. Carmel Valley Ranch enjoys a secluded setting amidst 500 acres of grounds. With chic contemporary rooms featuring private balconies, there is also a lovely restaurant and plenty of activities available to keep you busy. The remote Bernadus Lodge And Spa, set amongst vineyards and forestland boasts lovely rooms decorated in neutral palettes with fireplaces. Enjoy scrummy meals and spend your days relaxing by the pool. In a style borrowed from the Cotswolds, the Lincoln Green Inn is perfect for those looking for a little more privacy. Offering cottages with charming interiors, roaring fires and private gardens, it is ideal for a romantic retreat. If you've decided that you'd prefer the privacy of an apartment or villa then browse through the wide variety available online with our partner Booking.com. With a Mediterranean climate, the best time to visit is probably in the spring - from March to May. The summer months are often, unfortunately, blighted by coastal fog, so opt for the spring bloom instead. The average temperature is around 15°C. The closest major airports to Carmel are San Jose International Airport (75 miles) and San Francisco International Airport (110 miles). From the airport, either take the bus or the train on to Carmel. Browse through our list of all the best places to stay in Carmel. For a wider selection, check out all our California recommendations. Birdwatching - Carmel River State Beach is home to scuba diving but more famous for the scenic bird sancutury. Sights nearby - 18th Century Mission San Carlos Borroméo del río Carmelo. Great walks - Beautiful gardens and land to roam. 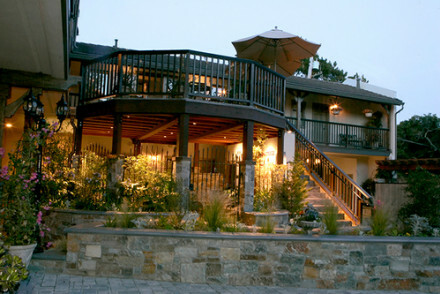 A warm inviting hotel just minutes from Carmel Beach. Rooms are colourful and stylish with a French twist. Some rooms feature large windows commanding fabulous views of the ocean. Dog and child friendly it's the perfect family getaway. Fishing - An ideal deep-sea fishing spot- there are several fishing tours in the Monterey area that provide charters. Sailing - Sailing excursions leave daily for many points along the central coast. A charming B&B just outside Carmel town. The quaint rooms feature a pick and mix of large bay windows commanding ocean views, cosy canopied beds, antique furnishings and wooden floors. The perfect spot for exploring this unspoiled corner of California. Great walks - Carmel Beach is perfect for a meditative walk and immersion in the natural beauty of the California coastline. Sights nearby - Mission San Carlos Borromeo del Rio Carmelo and Robinson Jeffers’ Tor House. Boutique B&B resting in manicured gardens offering spectacular breakfast, location and romantic setting. Large classic rooms are flooded with natural light and feature fireplace, spa baths and complimentary toiletries. History and restaurants are on the cards, or relax at the spa or with a book. Great walks - Walking tours aroud the historical Monterey State Historic Park, with three museums included, happen three times a day. Sights nearby - Watch the whales from Monterey’s historic Fisherman’s Wharf. Fishing - Monterey’s historic Fisherman’s Wharf for fishing trips. Kayaking - Sea kayaking for all the family. A historic Coach-house located in Carmel-on-the-Sea. The town is charming and characterful and well worth exploring. The rooms are recently redecorated with new carpets, linens and simple brass beds. Spoil yourself with on-site sauna and spa facilities. Great walks - To get the real Carmel-on-th-Sea experience explore the town on foot. Spa - On site spa and sauna facilities. Boutique B&B welcomes guests with a stone courtyard, spa and fireplaces. Modern, unique rooms with luxury bathrooms and breakfast in-room. Walking distance from the Carmel restaurants and bars. Relax at the spa, take a leisurely stroll along the coast or go out sailing and look out for whales. Great walks - Watch whales in January from spectacular vistas while the sea crashes against the cliffs below. Local markets - Friday Farmers Market at the Monterey Peninsula College parking lot. Spa - Offers a variety of massages & facials. Four Cotswolds-style Robin Hood themed private cottages, in the scenic town of Carmel-on-the-Sea. The cottages feature floral prints, exposed beams, cosy beds, fireplaces and private gardens and patios. 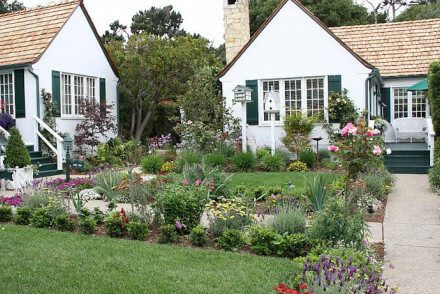 Homely, quaint and undeniably elegant. Great walks - Walk on the sidewalk or beach itself. Pets are welcome on the main beach without leads, but must be under command. Sights nearby - Within 15 minutes, visit Monterey with the famed Monterey Bay Aquarium, Fisherman’s Wharf, Cannery Row. Hideaway - Each cottage has its own private entrance and garden- total seclusion! !